Date : Issue of AD 353 to 355. Size : 18.0 x 19.0 mm. Weight : 5.23 grams. 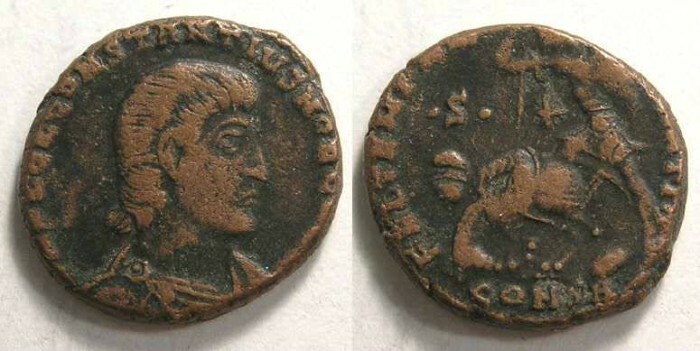 Obverse : Head of Constantius Gallus right, with DN FL CL CONSTANTIUS NOB CAES around (due to the small flan much of the inscription is off the flan). Reverse : Helmeted soldier standing left, holding a shield and about to spear a fallen horseman, with FEL TEMP REPARATIO around, and CONSB below (Arelate as Constantina, 2nd officina). There is a 'dot' S 'dot' in the left field, and a star below the soldiers arm. Much of the inscription is off the flan. This particular issue is always on this small size (18 to 19 mm), but this specimen was struck from dies that would have fit a slightly larger flan. The style of the reverse is slightly crude and there is no exact equivelent of this coin in RIC, which strongly suggest this coin is a barbarous imitative specimen.